Last week reviewed the possible formations for teams playing 7 v 7. My focus was on U9 and U10 teams but I received an email from Bryan, a coach in Maryland, who coaches a U15 girls team. He found the episode useful for his team even though they play 11 v 11 but they usually play 7 v 7 or 8 v 8 at the end of training sessions so he will use the different formations I described to focus on various aspect of the game that he wants to highlight. So even if you’re team doesn’t play their games small-sided the formations included in this episode and the last one can still be useful. This week I describe the formations you should consider when playing 9 v 9. This is an important transitional period since it’s the final stage before the players move to the full sided game. 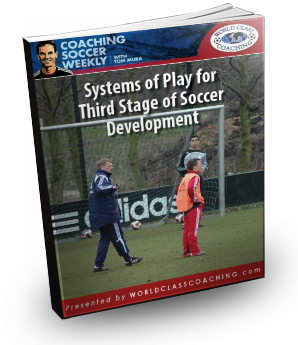 So not only should you consider the developmental benefits of each system but also how they might help your players gain a better understanding of what they’ll do in the full sided game in a couple of years. This includes seven different formations that I think could be used for 9-a-side soccer along with the advantages and disadvantages of each one. I also describe how using each one can teach your players something different about the game as well as which 11 v 11 systems they can be transformed into. At the end I’ll tell you which two systems I prefer and give you some activities to train the key concepts that I think are important for your players to understand to play within the formations most effectively. As part of the upcoming changes to the format of small-sided games in the US our U11 and U12 teams will now be playing 9 v 9 rather than 8 v 8. I’m pleased that US Soccer recommended this change because I think having nine players on the field allows for more flexible formations to be used in order to teach different aspect of the game. As I said in last week’s episode on the new 7 v 7 format, our primary motivation at these young ages should be on the technical and tactical development of our players rather than results. It’s with this in mind that I’ll discuss the various formations that you can use in order to select the one or two that will work best for your team. There may be others that I haven’t considered. If there’s one that you’ve had success with please tell us about it in the comments section of this episode on CoachingSoccerWeekly.com. My preference is to start with a 3-3-2 because it’s such an easy transition from the 3-3-1 formation that we have been playing in the 8 v 8 format. As the players become comfortable with this formation I will also introduce the 3-1-3-1 because of it’s flexibility and how easy it is for players in all positions to transition back and forth between attacking to defending phases. This begins as an exercise for the defenders to work on pressuring and covering with the ball in different positions on the field. Once they are comfortable with the concepts then you can make it a game where the attacking team attempts to get the ball across the endline and the defending team works to pressure and cover effectively to prevent this. 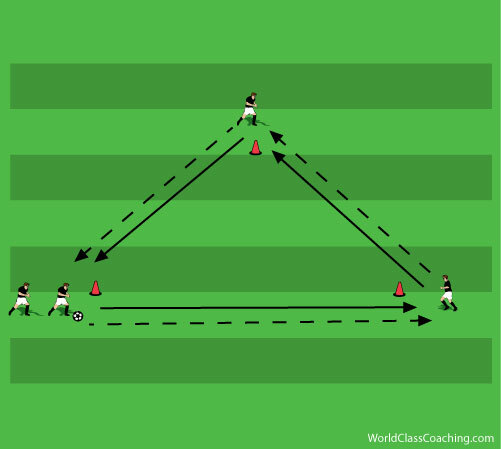 There are many triangle and diamonds created by both of these systems so working on the passing patterns that were described in Episode 8 – The Triangle Training Method. Will help create patterns that are useful for possessing the ball in these formations. This is a great pattern for working on playing up, back and through. The exercise can also be transformed into a shooting environment as described in Episode 34 – Getting More Out of Your Finishing Exercises. 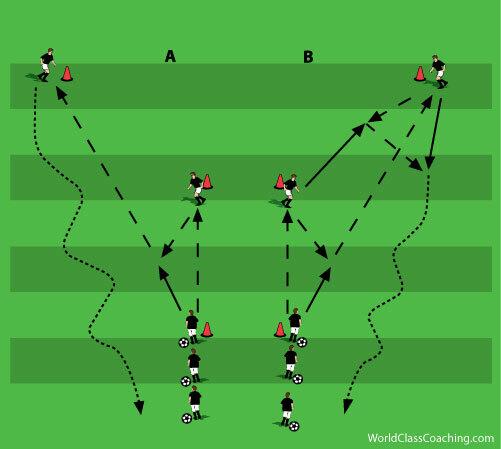 You can use any number of these formations to give your players an introduction to different ways to play or you can settle on one that will give you the easiest transition to the 11v11 game. I like to use two different setups so that they can see the strengths and weaknesses of each one without constantly changing so that the players are not overwhelmed. Whichever way you decide to go, make sure that stay focused on preparing your players technically and tactically so that they’ll be ready for the next step when the time comes. Next week I’ll look at another important challenge that players are faced with each year but it’s even more magnified with the age group changes occurring next year. How do you best prepare your players for the transition to 11 v 11 soccer? We are just about to move up from 7-a-side to 9-a-side next season and in our preparatory friendly games so far we have gone with a 3-3-1-1 formation and it seems to work. We go three at the back, three midfielders and one player in what we refer to as the ‘number 10’ position*, plus one striker. (*THE NUMBER 10 ROLE:- 10 in squad number terms, is the number given to the player who embodies creativity, flamboyance, imagination and inspiration through their play. The number has become synonymous with the position between midfield and attack, whether it be as a forward dropping deep, or a midfielder pushing on. That’s a great variation of the 3-3-2 that would help train the #10.